National Institute of Exports A Subsidiary of the National Chamber of Exporters of Sri Lanka ( NCE) / Partnered with the Sri Lanka Foundation (SIF).National Institute of Exports to enhance the export performance of Sri Lanka by introducing Professional Qualifications in International Trade Management and Export Practices. The training and qualifications provided by the NIOE, through its well-structured learning techniques will equip you to become highly recognized export managers, and reach the pinnacle as a professional in the field of exports. The acquired qualifications will also enable them to obtain ready employment in export oriented enterprises both locally and overseas. 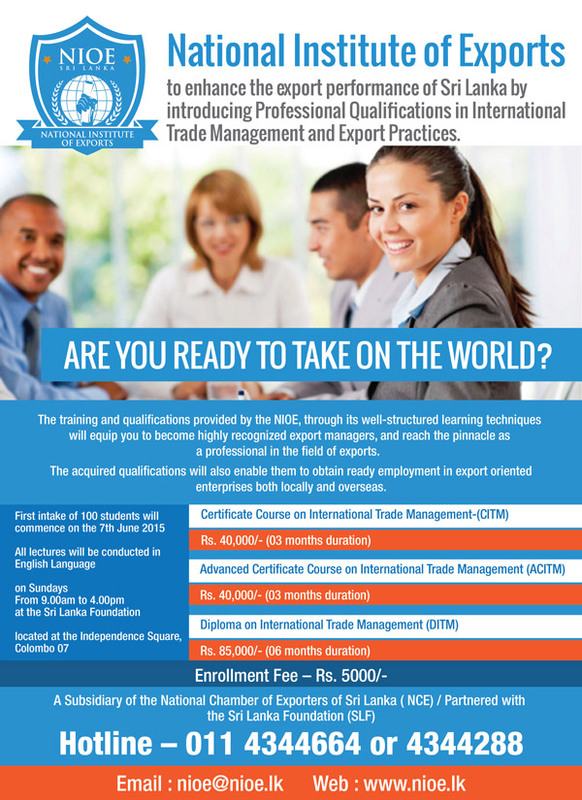 Following are the courses conducted by this National Institute of Exports in Sri Lanka.